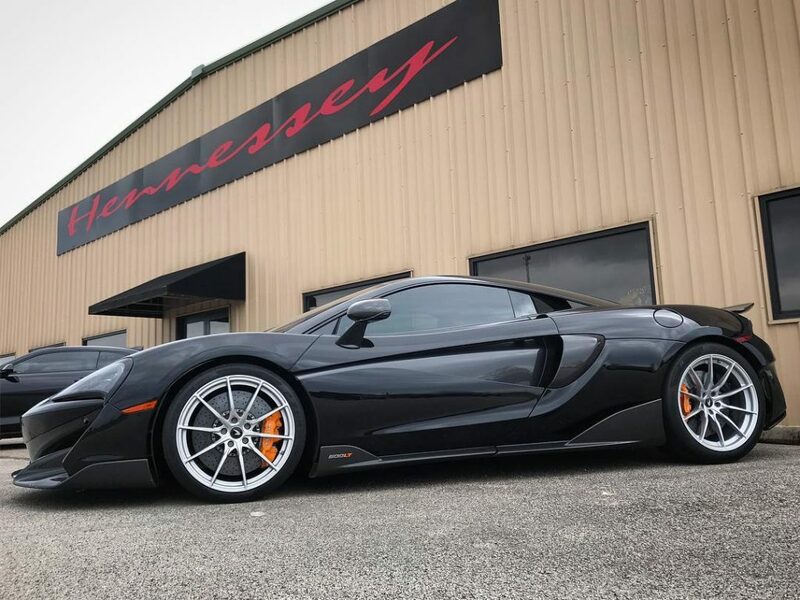 Considering the McLaren 600LT is not your run-of-the-mil Woking creation, the tuning scene will not get many opportunities to work on it but Hennessey Performance managed to get their hands on one which will result in some serious performance upgrades. Does the 600LT need more power? Certainly not but the crew from Hennessey Performance already have plans in place to fit it with a HPE800 package which as you guessed, stands for 800 horses (597 kW). That means the 3.8-litre twin-turbo V8 in the baby Long Tail will churn out more power than the mighty Senna. “The team at Hennessey Performance will increase its power even more – stay tuned,” is everything we’re offered thus far, along with pictures of a black-painted model at the Lonestar Motorsports Park drag strip. McLaren hasn’t capped production of the 600LT, but did mention the model will be built for one year. The same applies to the 600LT Spider. By comparison, the 675LT ended production after 500 units of the fixed-head coupe and 500 electrically-folding hardtops were completed.